Urban Development Services specializes in design management and retail economics for commercial revitalization. UDS seeks to develop approaches that are market driven and encourage pedestrian oriented development. 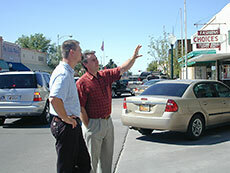 Urban Development Services grew naturally out of Scott Day’s 17 years of experience with the National Trust's Main Street Center. Urban Development Services has developed a merchandising workshop for small independent retailers focusing on the use of inventory control, open-to-buy, floor planning and visual merchandising. Scott Day’s retail background includes work as the merchandising and department manager for Potpourri, a contemporary home furnishings store in Milwaukee. Scott Day regularly conducts training sessions on urban planning issues, architectural restoration, sales leakage analysis and business recruitment and retention. Emphasis is on development of existing businesses and ways to grow these businesses into larger concerns while diversifying the economic base with recruitment of new, complementary enterprises. In addition to working with individual businesses, Scott Day has also developed design guidelines that facilitate the development of pedestrian oriented retail districts. These form-based codes are easier to understand and much easier to administer than typical style-based design guidelines. He has worked with Main Street programs in over forty states representing over 500 different communities.